Pictures may sometimes be worth 1,000 words, but they often either don't tell the whole story or tell a misleading one. Significant issues have emerged with what the press has read into the "iconic" photo taken of a crying two year-old at the U.S.-Mexico border by Getty Images photographer John Moore. The most important one, according to a UK Daily Mail interview with the girl's father left behind in Honduras with the couple's other three children, is that mother and daughter "were never separated by border control agents and remain together." Moore appears to have tried to be careful in captioning his photo and in describing its circumstances in interviews. The same cannot be said of others referring to it and reacting to it, many of whom, as will be shown in this post, have effectively created fake news in describing it. Despite Moore's apparent care, the Daily Mail interview points to a serious problem with his photo's initial description. Moore has posted the photo twice at Instagram. 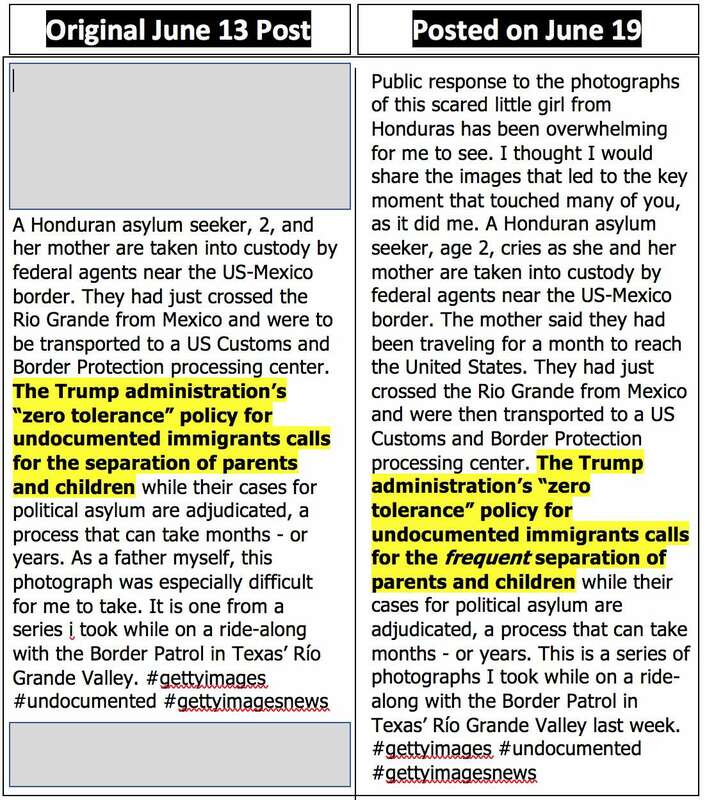 His initial post's description of it on June 13, while it did not assume mother-daughter separation, still told readers that their separation was a policy-based certainty. I wish I could say. When they take people away to the processing center, they don't give you information on what happens next. JOHN MOORE: Well, they had been body searching people as they were loaded into advance to be taken to a processing center where they were possibly separating parents and children. And one of the last people to get on the bus was the mother of this child and her daughter together. And when they went to body search her against the vehicle, they asked her to put down her child. And right then in that moment the little girl broke into tears and, you know, it's not unusual for toddlers in any circumstance to have separation anxiety, but I think this particular situation with the separation of families leads -- and gives a new meaning to that phrase. ANA CABRERA, CNN: Oh, God. I mean, that picture, it makes us all get tears in our eyes. It's so hard to see her -- her crying and seeming so desperate. When you took that picture did you know that it was something that it could become a defining image of this moment in history? MOORE: Well, I had photographed families trying to seek asylum many times on different visits to the U.S.-Mexico border. What it looked like in many ways was similar to what I had seen before. And I think the families there, no idea that they would soon be separated from their children. I can tell they weren't up on the recent news. They have been traveling in difficult conditions, but I knew what was going to happen next. And for me to take these pictures, scenes that I had seen before but with the knowledge that these parents and their children would soon be in separate detention facilities, made it hard for me personally as a journalist, as a human being and especially as a father. CABRERA: The [New York] Daily News used your picture on its cover. This picture has also gone viral all over the internet. Hard to find anybody who hasn't seen it. It wrote "Callous, Soulless, Craven Trump." The Daily News wrote those words. What words came to your mind? MOORE: Well, for me it was very simple. It was just sad. When I took this picture, I had very little time. When they body searched her mother it happened only over maybe ten seconds. I had to quickly move into position and take a knee and get on to the child's level. I had very few pictures before they were finished and they were bundled into a van and driven off. And so as I finished taking these photographs, I had to stop and take a few breaths and I was sort of overcome with emotion myself and then it was over and then they drove away. CABRERA: Do you know what happened to her? MOORE: I wish I knew. The word "frequent" in the June 19 description obviously means "not always," contradicting Moore's original description of what the Trump administration's policy "calls for." Sandra Sanchez has voluntarily separated herself from her husband and three of her four children, all of whom probably wept when learning that the two had left without even saying goodbye. Sandra Sanchez has torn two year-old daughter Yanela Denise away from her father and her three older siblings. Again based on what Hernandez has told the Daily Mail, supposedly heartless and cruel U.S. federal authorities have been more interested in keeping Sandra Sanchez and Yanela Denise together than Sandra has been in keeping her family together. Sadly, we probably know whether or not any U.S. media outlets will disclose or follow up on what the Daily Mail has found. The smart money is on: "Not a chance."